An FPP action game, set in an alternate Sweden in 1989, taken over by heavily armed machines. While Generation Zero features a single player mode, it was developed mostly for the co-op mode for up to 4 players. Generation Zero is an action game focusing on its multiplayer aspect. It was developed by Avalanche studios, known for e.g. Mad Max, theHunter: Call of the Wild or the Just Cause series. Generation Zero is set in an alternate 1989 Sweden. The country was taken over by heavily armed machines, and people are forced to fight for survival. You play as one of the fighters, resisting the machines and gradually discovering the reasons behind the invasion. Generation Zero utilizes a first person's perspective. The game features an expansive open world; the player characters have different abilities, so to succeed they have to cooperate. Apart from exploration, an important aspect of the game is combat. The enemies vary in terms of size, weapons, and damage resistance. You fight the biggest foes step by step, disabling their weapons and sensors and damaging their armor. Interestingly, enemies don't respawn with each log-in—they stay damaged until they are ultimately disabled, no matter how much time it takes. You can loot the defeated enemies, improving your battle potential. The gameplay is made more interesting by weather conditions and a day-night cycle. While Generation Zero features a singleplayer mode, it's the co-op mode for up to 4 players that offers the fullest experience of the game. 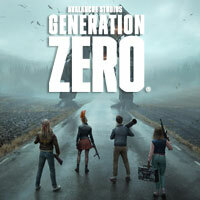 Generation Zero utilizes the original APEX technology, also used in RAGE 2 by Avalanche Studios and id Software. The 3D visuals of the game are high-quality, featuring many details, locations full of various plants, and detailed enemy designs. The production also features well-made sound layer and and an advanced AI, controlling the opponents.